Patrick “Pack” Walsh may not know exactly where he’s going in life, but he’s happy where he is. He’s got a girlfriend who gets him. His single dad is his best friend. After graduation, he has a desk job lined up at the local CrossFit gym, maybe he’ll even work his way up to trainer. He can’t see himself ever leaving the small town of Brooksby, Massachusetts, and he’s fine with that. Then, on his 18thh birthday, everything changes when a letter arrives from his mother. He hits the road, searching for a mother he thought was dead and a family he had no idea existed until now. His journey unearths questions about both of his parents that he never saw coming and by the end of the summer, Pack has a whole different understanding of his past—and most importantly, where he wants his future to lead. Questions I Want to Ask You by Michelle Falkoff is a coming of age novel that’s full of twists and turns. It was quite different than what was expected, and Pack’s journey of self-discovery and how he deals with his past is gratifying. Michelle Falkoff is a graduate of the University of Pennsylvania, Columbia Law School, and the University of Iowa Writers' Workshop. She is the author of several YA books that include Playlist for the Dead (2015), an NPR great read selection and Pushing Perfect (2016). At first glance, Questions I Want to Ask You appears to be a clichéd story of a teenaged boy on a normal path of discovery but deviates from a predictable plot to become an unexpected and enlightening journey of self-awareness. Although Pack is predictably irritating, there’s an understated congeniality about his character. He has an old soul who’s very set in his ways and thinks his entire life has been planned out. But like many people who are controlling and think in black and white, life has a way of throwing a monkey wrench into such plans. Surprisingly, one would think that the letter from his mother would be the focal point of the novel, but it’s just a side show to the real issues plaguing Pack. A good portion of the novel centers on his struggle with weight issues. He’s been teased most of his life and decides that a change is necessary. His obsession with losing weight affects his relationships, and it’s at this low point that he realizes that a change in plan is necessary. This process of maturing helps his character’s likability levels rise. 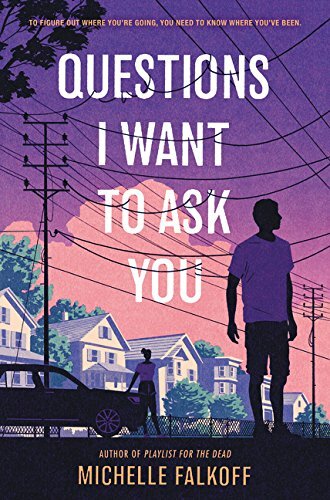 Questions I Want to Ask You is a superb coming of age story that examines the extraordinary struggles of a teenager on the cusp of adulthood. Although Pack’s processes of maturing is at times painful, it is necessary reality for his growth. Michelle Falkoff has created a thought provoking and inspiring read that is full of inspirational moments that are sure to delight anyone who’s fascinated with the complicated peculiarities of growing up.